Personalized Photo Curtains - Design Your Own in ANY Custom Size! Personalized Window Curtains Just How You Picture Them & In The Exact Custom Size You Need! Shoppers have many choices when it comes to window treatments. Blinds, drapes, curtains, swags, toppers, you name it and all can be found online. 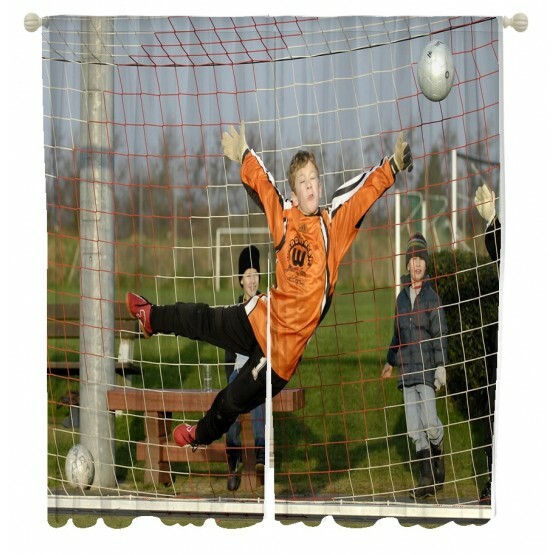 Custom personalized photo window curtains are relatively new additions to the product lineup. With these, custom not only pertains to the measurements of the curtains, it also has to do with the design of the curtain itself. Customers can upload one or more pictures and include personalized text to create a custom photo window covering. Anyone who is extremely particular about home decor and has the perfect design in mind may find that this is exactly what they have been looking for! Whether the person has a photograph of a recent trip or a series of pictures to be made into a collage, these images can be made into custom window curtians. Collage options include many different formats and from one image that covers the entire surface or up to 25 different photos nicely arranged. Customers can provide design instructions such as the desire to have the image split down the middle. They can also enter text that will be printed on the curtains and specify where they want the wording to be placed. For example, text can be inserted across the bottom of the curtains as a caption for an uploaded photo of a nature scene taken during a trip overseas. Various font styles and colors are available for this custom window covering. Those who are comedians at heart can incorporate funny sayings into a picture of their college buddies. This unique option is something to consider when personalization is the goal and you need truly custom window curtians. Your bedroom's illumination relies mainly on the drapery that you have. And your bedroom's entire look relies somewhat on the designs that you put up. It's not just about comfort, it's about looking good as well. Both functional and visual purposes should be met, not just one or the other. That is why having custom window curtains is best for all your home decor desires. By customizing your photo window curtains using your own photos and design, you don't only get the comfort you deserve, but also the decoration that you need. It's not most of the time that you get to have comfort and style together in window curtains. Sometimes, people have to settle for one over the other simply because they have no choice. But that's a luxury that we can offer you, here at VisionBedding. We believe that you've got plenty of creative ideas in your brilliant mind. You just need the right means to channel that creativity. Thus, we offer our custom size window curtains where you can use your own photos and designs for your bedroom decor in whatever size that you need. We can do any size from huge to small that can transform your room from good to great. Choosing the right photos for your custom window curtains might not be as easy as you thought it would be. Having the perfect window curtains, in all fairness, doesn't happen by chance or accident. You must put a lot of thought into it; considering possibilities and reaching beyond imagination. Your custom made curtains should match the interior of your room, as well as the other decors inside it. The colors must complement each other, while the patterns and styles are in harmony together. Only then would be sure that surely you have the best custom size window curtains. Fret not about how to make the ideal custom made window curtains because we have that covered for you. So basically, you don't just choose your photos to be on your window curtains on a whim. You need to have a bigger picture of how you want your room to look like. A theme, per se. You need to make your pictures work with your room's motif. So prepare your photos, your designs and the size you want your custom size window curtains to be because this is going to be one heck of a read. Think about the cutest picture that you took with your pet. It could be a dog or a cat or basically any animal worthy to be displayed on your custom window curtains. It would be much better if it had your face on it. You can put up a photo of you and your furry best friend for all the world to see on your drapery. Besides, nothing beats expressing how much you love them by having their face plastered on your custom size window curtains. Just make sure that they're looking at the camera in the photo. Then you can enjoy seeing their face first thing in the morning when you wake up to brighten up your day. The best picture to display on your custom window curtains is a wide shot photo of you on top of a mountain. Or a snap of you diving underwater or parachuting across the skies. You may have a vast collection of nature shots you took on your trips but having you on those shots makes it ten times better. Besides, imagine when you have a friend over and you tell them about your custom made curtains. They will be impressed by how amazing the photo looks but they probably won't be convinced that you really took the photo. Pics or it didn't happen, as the famous line goes. So you need to be included in your photo. Be one with nature, they say. Indeed, be one with your nature photo for your custom size window curtains. You can't guarantee that you'll remember the best moments of your life forever. That is why photographs exist. They help you reminisce the times that have passed and also remind you just how thrilling it was. Sometimes, the most exciting moments of your life don't happen inside your home. Most often than not, they happen inside a stadium, an arena, or a basketball court where you cheer your heart out. If you have taken a photo with your favorite players, putting them on your custom window curtains will be a great memorabilia. Every single day, as you wake up, you get to relive that exhilarating moment, in turn, making your day great. You can also display a photo of you playing the sports you love. It could be when you won a match or when you made your first goal, your first home run, or whatever momentous moment in your sports career. Having that as your custom window curtains would be like a trophy in its own right. One way to start a great conversation is to talk about hobbies. It's a great means of knowing your common grounds with someone. So, if you want your custom window curtains to be a great conversation starter, consider displaying a picture of you doing what you love the most. That way, when new friends come to your house and go to your room, they would notice how awesome you are at what you do. Just make sure that you just don't take a photo of your hobby. You have to be in the frame. Like, if your hobby is reading, a photo of you reading a book in a library would be so amazing. If you are fortunate enough to document your death-defying stunts over the years, then you have the perfect photo for your custom size window curtains. All your photos that scream adventure in them is worth to become your custom made window curtains. Like jumping off a cliff, parachuting off an airplane, bungee jumping, and other crazy adventures that you had. You can personalize your window curtains with the craziest thing you ever did on an adventure. That way, you can always relive the moment and get thrilled to more escapades in the future. Nothing can probably cheer you up more than your family can. When everyone else fails, you can always count on the people who share your blood. So to avoid missing them, you can have your family photo on your custom window curtains. They can bring you comfort unlike any other just by looking at their faces in your room. That can definitely brighten up your day, more than all the rays of the sun combined. All these are just but a few ideas for the perfect photos to have on your custom window curtains. We're pretty much sure you have a plethora of schemes that you have on your mind. Our custom made window curtains cover all sizes that you need. These can be great for your bedroom, living room, kitchen, and any other rooms that need custom sized window curtains. As said earlier in this article, when you customize your picture window curtains, you don't only get the comfort you deserve but the decoration that you need. And with that principle comes multiple benefits. Having custom made curtains can actually do you a lot of good. From the photos that you choose to the size that you want, you can find perks in every bit of your choices. If you think you're merely picking photos to put up as your custom window curtains, you're wrong. It's actually more than just that. You're really incorporating yourself into those pieces of fabrics. It's like you're putting yourself in it. It takes courage to let your guard down and let the world get to know you more. To let the world see your best moments, your craziest adventures, and your beloved family. When you let someone in your room and has them see your custom size window curtains with a photo of your fondest memory there, it's like you're telling them you want them to get to know you better. It's also one way of introducing yourself. If you can't find the right words to tell people about yourself, you can let your custom made window curtains do the talking. Photographs may be the best thing that has ever happened when it comes to keeping memories. Videos are great as well but you can't really display them on your custom window curtains. Having your fondest memories flaunted on your custom made curtains can bring about a huge wave of beautiful nostalgia. You can have tons of photo albums to store your memories but custom size window curtains are different. You just focus on that one particular time that you want to remember every waking moment. And then you take that and turn it into wonderful custom curtains. For years you've been giving the people you love what they want, now it's time to give them what they need. Or probably something they didn't know they needed. Having their photos on their very own custom window curtains will definitely make them happy. For your parents, siblings, grandparents, friends, and significant other, this can be a really fun way to wish them well. Our custom size window curtains are great for all occasions! Weddings, birthdays, anniversaries, graduations - you name it all! You just need to provide your own photo and designs and customize it with texts and so on to make it really personal. Now you can step up your gift-giving game with these custom made curtains. There's no better way to preserve your memories in the most fashionable sense than to have them on custom window curtains. You can have physical photo albums and those on social media, but you don't really go over them. Those are just memories that you keep but you don't really plan to remember. However, for those extremely rare and special moments that you just want to keep alive, those are the greatest. Those moments that you know you don't have the chance to do again, those photos deserve to be on your custom size window curtains. For example, a photo of you and your beloved grandparents or a picture of you when you were young. Or even the photo of your parents when they got married. These moments are those that you can't take back or have a do-over. These pictures would look exceptional as your custom made curtains. When you put up a photo of the greatest memories you had, it creates this urge to go out there in the world and make more of them. You see? It's not just merely choosing photos at random, but then those that you have chosen can bring such an impact in your life. Your custom window curtains can make you want to live more and see more of the world. So that when you get home, you have another trophy for your windows. Living life collecting memories instead of things is a great way of living. And you can have custom made curtains to testify your thirst to seek more adventures. These days, custom made curtains don't just change the visual proportions of your room or block out too much light from the sun but they also do you a favor by safekeeping your memories on their fabrics. Displaying personal things about yourself just shows you truly are comfortable where you are. The place where you can put up your photo on your window curtains is a place you call home. So stack up on your photos and ready your photographic skills because your custom size window curtains are waiting for you.